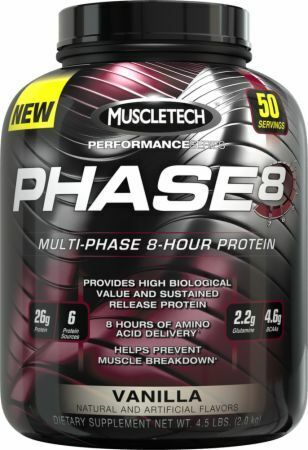 MuscleTech Phase 8 - 4.5 Lbs. (Milk Chocolate) for $19.95 at IllPumpYouUp.com! BLOWOUT sale! Yes, this is one of the most notoriously amino-acid-infused proteins ever, so we have no clue how much of that 26g protein is actually REAL dietary protein from whey and casein. But when it’s THIS cheap… it almost doesn’t matter. You’re now talking about 60g of “protein” per dollar - 50% beyond our threshold for a hot deal, even if you’re conservative with the amount of actual protein. Price Per Unit to get on Deals Page: $5.00 per Lb. MuscleTech Phase 8 - 4.5 Lbs. (Milk Chocolate) for $22.12 at Amazon!